This is a well written book, very clear and allowing the reader to further research any area of particular interest. It starts with a history lesson and the lament of how very little survives to give a glimpse of the druids of old. 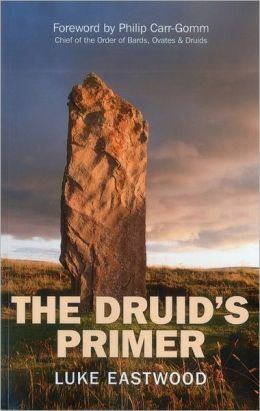 Usually, druidic history is extrapolated from Irish sources, as they are the most known, but Eastwood goes farther and gives a very good overview of Scotland, Wales and England, as well. Once in the modern times, he does not shy to name unreliable sources (like the Barddas) and explain why he finds them unreliable, despite the fact that those sources widely influenced the modern practice of druidry. He also makes it clear that in his opinion, druidry is a valid path, but it cannot be the same as the one practiced before the coming of Rome. What is druidry today is a reconstruction at best and a fantasy at worse. What follows is all the material one could wish to have at her fingertips to start a druidry practice. There is a repertoire of many gods and goddesses, an overview of myths, the eight fire fests, tools of the trade, et cetera. I would have loved such a book when I began my journey as a druid, instead of gleaning bits and pieces all over the place. What I appreciated the most are the comparisons between translations and between worldviews. Often druidry is seen as a monolithic bloc, with all the druid following the same path; this is not so. In the chapter Elemental Forces we can see an explanation for a four directions worldview in synch with the compass points and also a three directions in synch with the three realms of sea, land, and sky. Later, in Cycles of the Sun, Moon and Earth, we have two different approaches to Samhain and New Year and at the same time we are told that it is not even certain these feasts were celebrated by the druids of old or, if there were, how it was done. At least you can feel what resonates with you and then back it up with facts should you find yourself engaged in a debate. There is a whole part about divination and ogham and I was surprised to learn that ogham was not as widely known across Celtic land as I thought. It is mostly Irish and has been well-embraced by the modern druid. There is a very nice chart listing the name of the ogham according to Damian McManus and Niall Mac Coitir’s translation where we can see the subtle difference between old texts. I would have loved to part with this book holding more certitude than before, knowing I am following a path unbroken from time immemorial. It is very clear, though, that that it is not the case — but at the same time, if the druidry of old adapted to its surrounding, surely what is recognized and practiced today is a valid path. Maybe the awen that shone on our ancestors is the same that shines on us today, as we strive to connect more deeply with nature and the gods.